The US Supreme Court has ruled that police (or ‘cops’ in USA) have to get a search warrant before using GPS devices to track a suspect’s vehicle. This ruling went ahead despite President Obama’s administration opposing the ruling (I mean who cares if he’s the president). 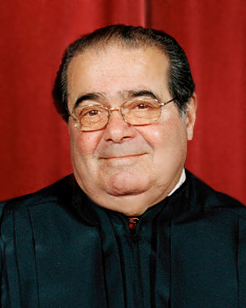 In delivering the decision, Justice Antonin Scalia (pictured) wrote that the court holds “that the government’s installation of a GPS device on a target’s vehicle, and its use of that device to monitor the vehicle’s movements, constitutes a ‘search’ ” and therefore violated the individual’s Fourth Amendment rights. The case that brought us this ruling? A nightclub owner, and suspected drug dealer, was going about his joyous life without a care in the world unknowingly having his car’s movements tracked by the police for over a month. The police brought him to justice having gathered enough evidence. The good news is the good guys caught the bad guy and put him behind bars for LIFE. Hurrah! The bad news is that the conviction was overturned in the appeals court as the police didn’t have a search warrant when they tracked his vehicle. Boo. Fantastic work by the judge to not only waste money, time and effort but to also put the criminal back on the streets.